Allegro Medical offers a complete line of Prevail Protective Underwear. Manufactured in the United States this product is ideal for women and men who want the look and feel of underwear. Application is easy, just pull them on. The soft, stretchable, cloth-like back sheet provides an incredibly secure and comfortable fit. The XL size fits waists 58" to 68", the XXL size fits waists 68" to 80". Please ensure you purchase the correct size so the product stays in place and doesn't leak. Many regular users rave about the superiority of this product compared to other cheaper brands. Prevail underwear stays up and doesn't stretch or sag when saturated. They lock in the odor more so than other products. Above all, they have a cloth-like feel and are breathable, not plastic. Try a package of these out, and you will soon be a believer. Prevail Silky-Soft Outer Fabric: Through technological advances, First Quality has developed a new, innovative material that is softer and more comfortable, making our protective underwear feel even more like regular underwear. Soft, Breathable Zones: Ventilated waist panels allow air to freely migrate to the wearer, improving skin health and comfort by reducing heat build up. Cloth-Like Outer Fabric: Soft outer material with breathable zones can improve skin health and wearer comfort by eliminating plastic against the skin. Comfortable. Protective. Discreet. Delivered promptly . Long Term User. No answer. Comfortable. Protective. Discreet. Dependable . Daily Use. Home. Office. Emergencies. Travel. Outstanding product at a great price! Comfortable. Protective. Discreet. Easy to use. Daily Use. Home. Office. Travel. Emergencies. This is the softest, most comfortable item of its kind that I have used. It pulls on and off just like regular underwear and has great absorbancy with a lack of odor. Comfortable, great value, quick delivery. Reliable product. 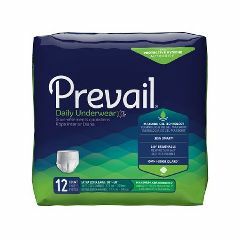 Comment: I tried to answer your question about Prevail Extra Absorbent Protective Underwear, but had trouble identifying the correct product. Our package that most nearly fit was "SureCare" Protective Underwear. In fact, almost every time I go to order, I have trouble identifying the correct product--the color of the package and identifying numbers I have trouble matching. I would highly recommend that you try to find a way to standardize numbers on packages so they correlate with web page numbers and invoice numbers; also it would be great if you could find a way to make up packages of samples (2 - 5 each) of related products, because yes, it is difficult to find the best one. Maybe your suppliers would be interested in putting out small packs which could also be used when a person is taking a short trip. I would gladly pay $25 - $30 for samples of several related products, as my husband has tried several and none has been absolutely perfect. We are retail and do not carry samples. The manufacture of the product might have a sample program. Prevail Extra Absorbent Protective Underwear--Bariatric--works very well if you use it right. If you want to email me at [email protected] I will give you some hints that probably are not appropriate to post here.